An gallery painting is a painting of an art collection. A notable trend in neoclassical painting by Giovanni Paolo Pannini and Johann Zoffany, the trend started a century earlier with the works of the Flemish school and their 'preziosenwände', depictions of wunderkammer and cabinet paintings. 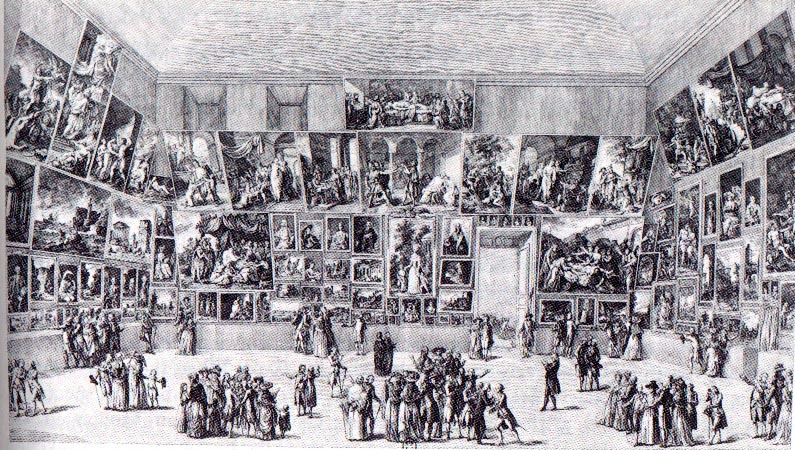 The Gallery of Cornelis van der Geest by Willem van Haecht. Hubert Robert View of the Grand Galery of the Louvre. Galerie eines Sammlers from the studio of Frans Francken the Younger. Salon of 1785, a painting by Pietro Antonio Martini. Unless indicated otherwise, the text in this article is either based on Wikipedia article "Gallery painting" or another language Wikipedia page thereof used under the terms of the GNU Free Documentation License; or on original research by Jahsonic and friends. See Art and Popular Culture's copyright notice. This page was last modified 20:20, 25 July 2013.